Many people have seen Olympic or Grand Prix level dressage on television. The horses seem to do intricate maneuvers as the rider sits almost motionless. Dressage isn't just fancy moves with hard to pronounce names! Every time we train our horses to carry us with more ease and respond to subtle aids, we are training them in basic dressage. 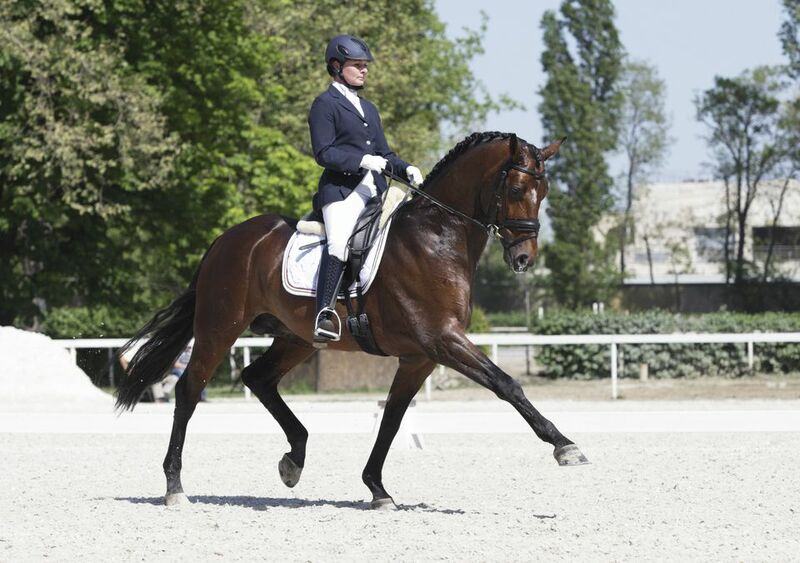 Dressage is teaching a horse to be supple, balanced and responsive. The goal of dressage training is to develop a horse's flexibility, responsiveness to aids, and balance. This makes the horse stronger and more pleasurable to ride. If you compete, you will always be competing against yourself, as well as others taking the test. The goal of competition is to always improve your own score. Braiding equipment for your horse's mane. Gloves, shirt, jacket, breeches, boots, and approved helmet. When riding a dressage test, you will be evaluated by up to three judges. The judges will give you a score on every element of the dressage test as you ride. They will look for obedience, suppleness, accuracy, attitude, and how well you ride. The dressage ring is marked at its perimeter with letters. Before you enter the ring, you will hear a bell or a whistle. This lets you know you have a certain time to enter the dressage ring before you are penalized. You will enter and salute the judge. After halting and saluting the judge, you will ride in straight lines and circles as described by your test using the letters as your guide. You will ride at different gaits and variations within the gaits. For the basic levels, you don't need to have the test memorized. Someone may call out the dressage test from the sidelines. You may also choose to sit or post the trot. When you have completed your test, you will halt, salute the judge, and leave the ring. At the end of the dressage competition, you will receive your scorecard, with a final score. Work on improving your horse's or pony's flexibility and responsiveness. It's important to train slowly. Forcing a horse into 'frame' could cause sore muscles and a reluctant horse. Your horse might learn to carry his front end properly, without learning to drive with his hind-end. This can cause soreness and a reluctant attitude. Help your horse learn his lessons completely and allow his muscles time to adjust to moving in a different way than he may be used to. Practice each element of the dressage test without riding the entire test repeatedly. The judge is looking for willingness and obedience to your cue, not how well your horse can memorize! Practice so that you're collected, working and extended gaits are distinct, and the halts are square. If you only spend time dressage training your horse, you will soon feel you are going to spend every minute ordering him around. Spend some time trail riding so he has a chance to stretch, use all of his muscles, and develop cardiovascular fitness. Allow time for relaxation and fun. For the test, you will want your horse spotlessly groomed, his mane braided and tack cleaned. Dressage training is hard work. Dress in comfortable layers according to the weather. It will be easier for you if you have the placement of the letters memorized before riding a test. You can easily make arena letters out of up-turned detergent buckets, pylons, or scrap wood that can be painted or written on with a waterproof marker. If you don't already work with a coach, finding one that has dressage experience will make it easier than trying to work alone. As you train your horse, you'll be learning how to cue more accurately using your seat, hands, and legs. You will also need to concentrate so that you can ride each movement with intention and precision. Plan what you will work on each time you ride and learn to focus on one element at a time. For the test, you will wear your English riding habit. Women will wear their hair in a net or bun. Basic dressage training is valuable whether you plan to compete in the sport, or in any other discipline. Jumpers, trail horses, pleasure horses, and English and western show horses can benefit from dressage training. Your horse will become more athletic and obedient and you will become a better rider. If you compete in dressage you'll quickly find that the greater challenge is trying to improve your score, not just bringing home a rosette. With every element receiving a mark out of 10, you will be able to see what aspects you need to practice before you ride the next test. You will be able to progress through the levels at your own pace. Kurs allow you some creativity and a change from standard tests.